SPOILERS for Tom King's and Mitch Gerads' Mister Miracle Issues 1-6. A brilliant Nick Derington cover. The title of this post comes from the very first issue of Mister Miracle published in 1971. It still rings true for the current day. Tom King and Mitch Gerads already have done on amazing work on the Vertigo series Sheriff of Babylon. They continue to do amazing work on this current Mister Miracle series. They are already about the halfway mark and it's an interesting and thought provoking read. The story pacing is incredible and the art is stupendous with the use of the nine-panel grid that controls the reading of the story. We have already had a heads up here with a Tom King interview about this comic book but to read the actual book takes it to another level. I can't wait to see where this story takes us. I'm going to give a quick rundown of the series up to this point so STOP now and read this book if you haven't already. 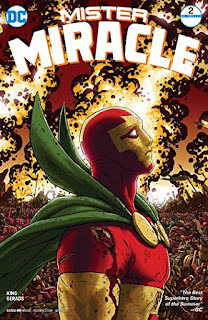 The book starts with Scott Free aka Mister Miracle bleeding on the floor of his bathroom. He has slit his wrists, either in an attempt at suicide or to pull the ultimate escape artist trick and escape death. There is a flash of a young Scott drawing a picture at a desk to illustrate a story about the face of God. He is rushed to the hospital and placed under suicide watch until he can return home with his wife Big Barda. 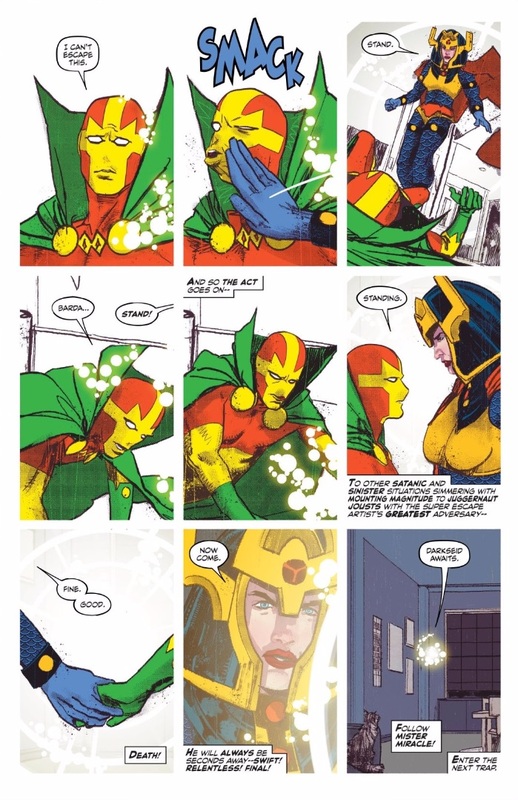 Once home, Scott is beaten up by Orion as "a lesson" until Barda stops him and questions Orion's right to do so. 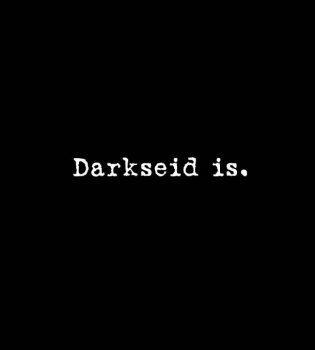 This all happens before Highfather comes to announce war with Darkseid and the forces of Apokolips, telling Scott that Darkseid has the Anti-Life Equation. 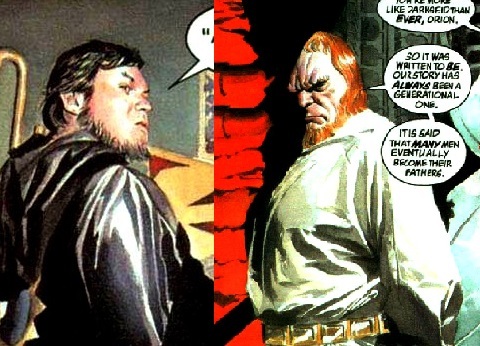 Highfather dies and Orion takes control of New Genesis as the new Highfather. Scott and Barda are called back to go to war. While all this is going on, Scott is seeing things like the ghost of his dead friend Oberon and questioning his sanity. This is an interesting exchange in the bigger story. There is war and Scott leads troops in the fight against the Apokoliptan forces in the position of a general while his grasp on reality still seems to be in decline. 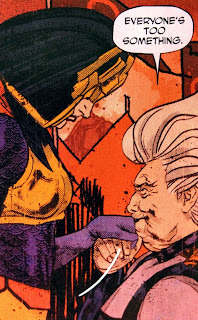 Ultimately, Orion sends Scott and Barda to kill Granny Goodness, the woman who "cared" and tortured them as children on Apokolips. 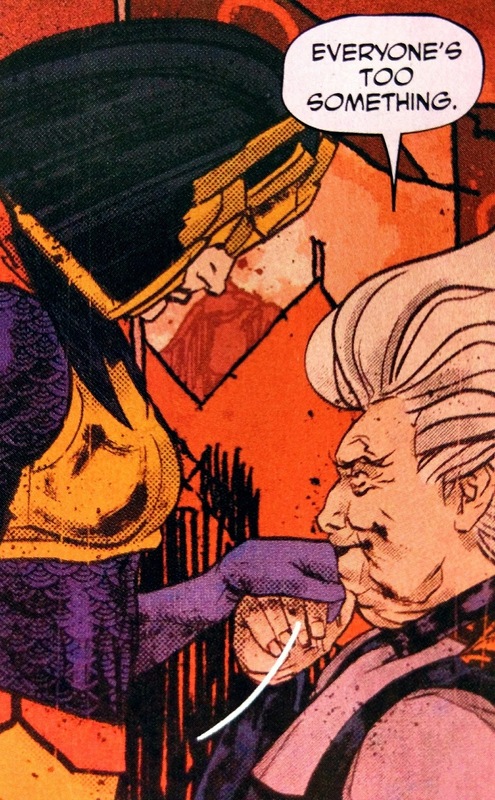 Granny tells Scott that she was Highfather's mole and is suspicious of Orion but is killed by Barda. Scott is later approached by the observer god Metron and told not to "know the face of God." He is also visited by the Bug Forager who complains about his people dying for the cause of Orion and wants Scott to take command. Forage is then killed by Lightray, Orion's now second-in command. Scott's sanity and allegiance is questioned by both himself and Orion which results in a trial. Orion judges Scott guilty of being infected with the Anti-Life Equation after he attacks him. Scott spends his final days with his wife Big Barda who convinces him to talk to Orion to save his life and if that doesn't work, well, "cut his #$^@ing #$^@$ off." Ouch. Scott survival is made all the more important with Barda revealing that she is pregnant. Then the final two pages of issue 6 are revealed and I'm not telling you what those are. Read the series. There are nuances and more plot beats here than I have included so get your hands on this comic book. 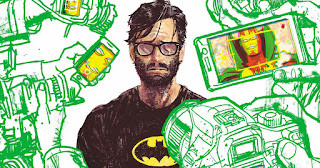 Tom King is doing a bang up job and smarter folks than me have already discussed the deeper meanings and issues in this tale, Mr. King included. There are topics like the face of God and love there to be addressed. But I also think that the story of Scott can take on a personal meaning and even a different take depending on what lens you are using. I've already written about what Scott Free means to me before on this blog. For those reasons and just the level of good storytelling this series has, I find deeper meaning in this than maybe what might actually be there. I might be allowing my own vision of what this character is in my head influence what I'm seeing but I'm going to share anyway. Scott has always represented the ultimate weapon against Darkseid and the Anti-Life Equation. The prophecy is that Darkseid will be cast out of his position of power by his son but I've never really took that as literal. I've never seen Orion as the one handing Darkseid his defeat and taking over, although Alex Ross did give a cool idea of what this would look like for both Scott and Orion in the Kingdom Come series. I always saw Scott representing freedom and since Darkseid's Anti-Life Equation isn't actually death but the lack of independence, Scott makes the natural foil. What Tom King does here is interesting because he takes an idea given by Julian Lytle that Anti-Life and, more particularly, the sentence "Darkseid is." is when someone makes a wrong decision when they need to make a good decision. I believe this is still the same idea of lack of independence if you consider Darkseid as the ultimate manipulator behind someone making these wrong decisions. What makes this compelling in this story is if you observe Scott's state from page one, you have to wonder if Darkseid hasn't already begun to win and if this whole story isn't a story of Scott trying to break free of this. Scott is worried himself that he might be infected with the Anti-Life Equation. It is this worry which gets us to the point of his trial by Orion, who himself may be also infected. Orion's actions is to begin to let power corrupt him, show his enemies no mercy, kill his subjects that disagree with him and become more like his birth father than the man who raised him. Orion sees the world in true or false and that can become dangerous in our world and the Fourth World. What makes my brain break about this whole journey is this idea that Scott is slowly succumbing to the "Darkseid is." infection and it isn't that terrifying. Maybe "Darkseid is." is just how the world is or is becoming. We, like Scott, are accepting out fate. We are making the wrong choices and that is becoming the status quo on how we now operate. We allow craziness to occur around us and don't speak up until it is very late to do something. Scott is battling paranoia and trust and as a reader, I'm going through it with him. Who to trust and what path to take seems hard to figure out. Should Scott play the role of celebrity somewhat foisted on him by the world and the likes of Gordon Godfrey and Funky Flashman? Should he follow Orion's orders like his wife Barda (sometimes) does? Is he who the world sees or is he someone else? There are two moments that I think touch on this. One is Scott and Orion discussing boundaries. Orion asks if we are bound by the laws of The Source and Scott responds with "We're all bound by something." This is definitely true and that can be a good thing but this is a wild answer coming from the New God of Escape. What does that mean in the grander scale of things? She still scares me but less in this. The other moment is Scott realizing he doesn't really have a name. Sure, he is called Scott Free and Mister Miracle but are those his name? His parents didn't give those names to him. He was called Scott Free by Granny Goodness because of his penchant for trying to escape and the Mister Miracle moniker was gained from the original Mister Miracle on Earth after he died. Scott's identity is at worst unknown and at best fluid. Granny even makes note of it when Scott talks about the prophecy of Darkseid's son. She first says that the prophecy is compelling everyone's actions and then she asks Scott "Is (Orion his son), Scott? Is he? Or are you?" Granny is not a good character and her reliability is iffy but the question is fair. Scott was raised on Apokolips after Darkseid and Highfather traded children. The argument could definitely be made that Scott is more Darkseid's child than Highfather after all he went through. All of this is begging the ultimate question that Scott, and maybe all of us have to ask- are we truly free and living or are we following some script of some dark God behind the scenes of it all? I could go on with peeling into this onion of free will and all the possible meanings in this book but I will instead leave you with this: This series is really good, y'all. Really good. I can't wait for the second half.